Summer is a great time to be a pet. The days are long and most kids are out of school. That leaves plenty of time for lots of attention and some serious fun. But summer can also be dangerous. Playing or exercising a dog in the heat can bring on a lethal case of heat stroke. Burrs, foxtails, and awns from parched grasses can cause painful infections, and the chemicals we use to keep our beautiful summer yards green and control pests can poison our pets. Prevention is the best way to protect your pet, of course. Always keep an eye out for potential hazards, and do your best to minimize or remove them. Keep pets cool and calm in the hottest part of the day, and check frequently for plants and insect problems (ticks are nasty in the summer). Finally, use household chemicals sparingly and according to label instructions, and store them properly and securely. Sometimes an animal may seem fine, such as a dog after being hit by a car or a cat shaken by an attacking dog with no puncture wounds. However, the story inside may be quite different. 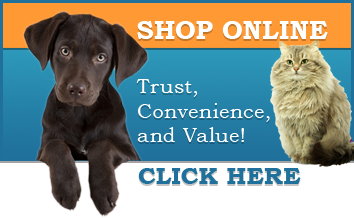 Internal injuries may need immediate veterinary attention. Any delay can cost your pet their life. Most everything else can wait until morning, or even Monday if it's the weekend. However, please remember, on behalf of your pet: Just because something can wait, doesn't mean it should wait. If your pet is in pain, please take him in. Some of the signs an animal is in pain include panting, labored breathing, lethargy, restlessness, loss of appetite, aggression, hiding, or crying out. Source: Excerpted from VIN (Veterinary Information Network) 2009. As we humans escape into our homes that are air conditioned or cooled with fans we wonder why our dogs might be acting sluggish or begging to get back inside. Have you ever noticed dogs who refuse to walk at an event and just plops himself down? Paws scorching on the Asphalt could be the problem… not your dog being stubborn. The pads of a dogs feet are not any thicker than our feet so if it feels hot to your bare feet then it’s just as hot to your dog. Asphalt temperature and the outdoor temperature are two very different things. When the outside air temperature is 77 degrees the asphalt in the sun is 125 degree’s. You can fry and egg at 131 degrees just imagine how your dog feels as you drag him along to the farmers market or outdoor festival being held on asphalt. 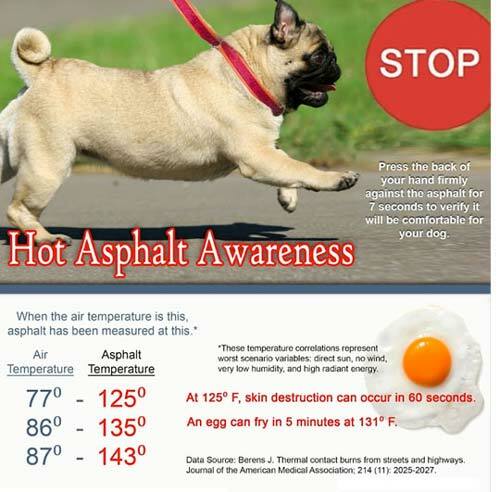 Is the asphalt too hot for your dog? Place the back of your hand against the pavement and hold it there for 11 seconds… if its uncomfortable for you to leave your skin there, then you shouldn’t make your dog do it. You can also try walking on it barefoot yourself. Also think about the time of day, it takes hours for pavement to cool off after the outdoor temperature goes down. Think about how the streets stay clear for quite a while when it first starts to snow, that asphalt has stored the heat from the day. Much better to head to your outdoor event in the morning when the pavement is cool if you really think your dog is going to enjoy it. Those cute paw pads aren’t covered with fur which would give the dog a little more insulation if they were. A basic ‘rule of paw’- If the pavement feels too hot for your barefoot, it is too hot for Fido’s. Pressing your own bare hands and feet on the pavement for at least 7-8 seconds is a recommended strategy to assess heat level . If the 7-8 second test yields a comfortable temperature, it is still critical to consider other factors to assess safety accurately. The air temperature is NOT an accurate reflection of ground temperature at all! Asphalt and other ground surfaces retain heat and this temperature rises exponentially as heat and sun exposure continues. (See chart above). Furthermore, the time of day is very relevant! Asphalt soaks up the heat all day and can only cool down at a certain rate when the sun retreats- so pavement that was deemed safe for a walk at 9 am may differ greatly at high noon and into the early evening. If you want to take an outing with your dog in the summer think water! Even non water dogs still like to run along the edge and get their doggie tootsies wet and your feet will like it better too. Original image source: Dr. Pia Salk Blog at MarthaStewart.com.